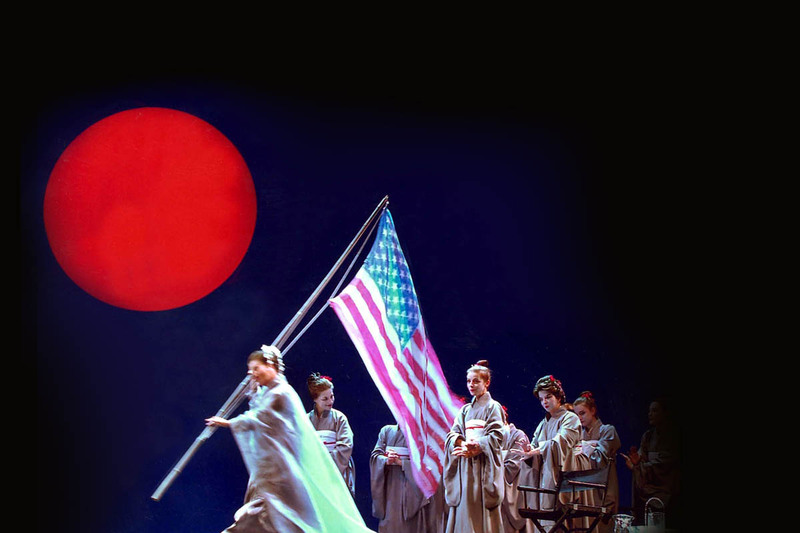 The arrival of Madam Butterfly (Lynn Fortin) carrying the ‘Stars and Stripes’. 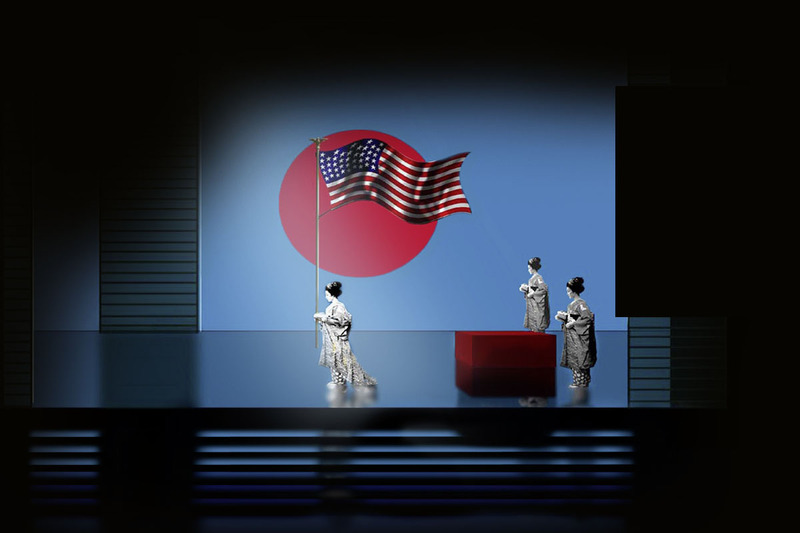 ‘The stage displays both the Japanese and American flags in semi-permanence. 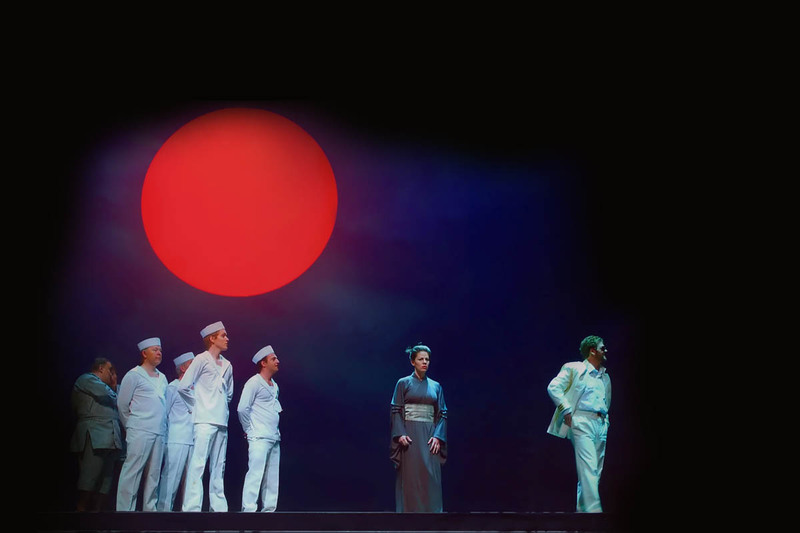 The American sailors and Pinkerton (David Pomeroy) are greeted by the bemused Suzuki (Allyson McHardy). 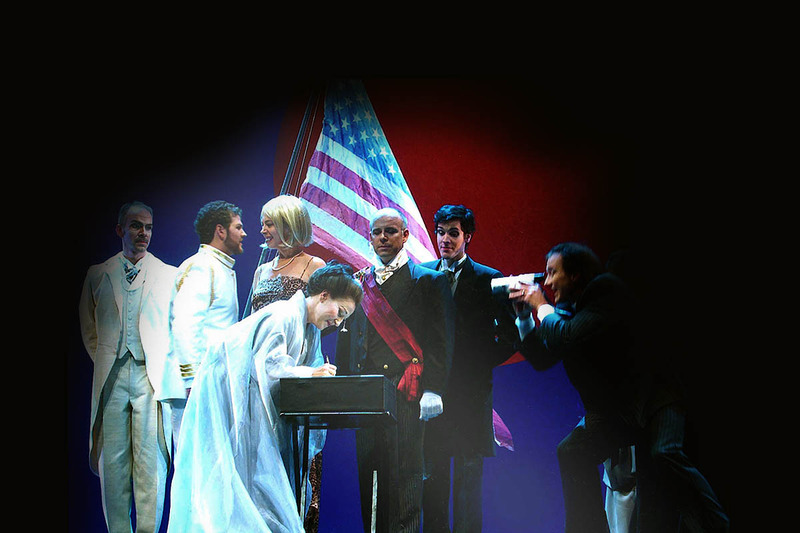 Sharpless (Marc Belleau) looks at Pinkerton (David Pomeroy) as he meets Kate (Katrina Corbeil), while Butterfly (Lyn Fortin) signs the wedding contract. 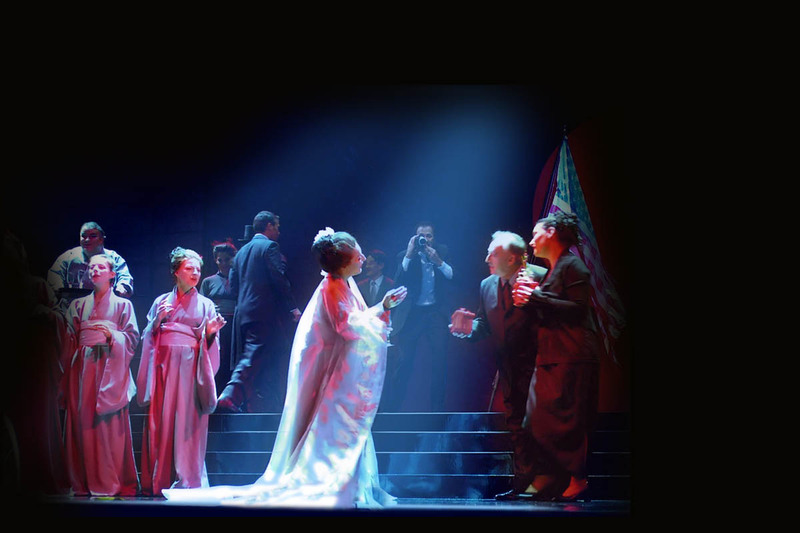 Madama Butterfly (Lyn Fortin) accepts wedding gifts, while Goro (Benoit Boutet), films the event. 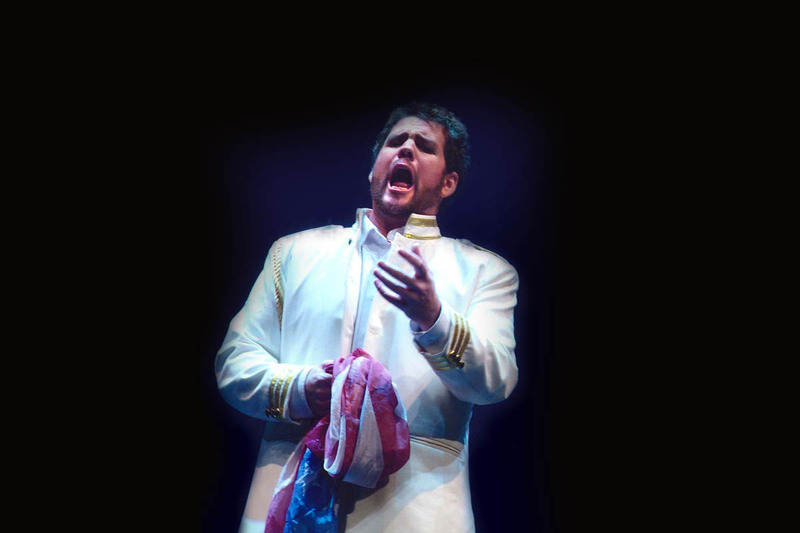 The arrival of the Bonze (Stefan Szkafarowski). 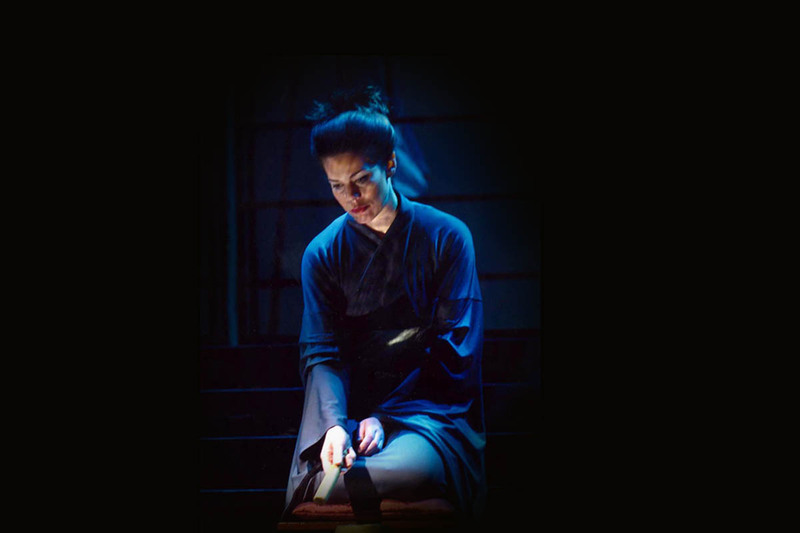 Suzuki (Allyson McHardy) prays that Butterfly will stop crying. 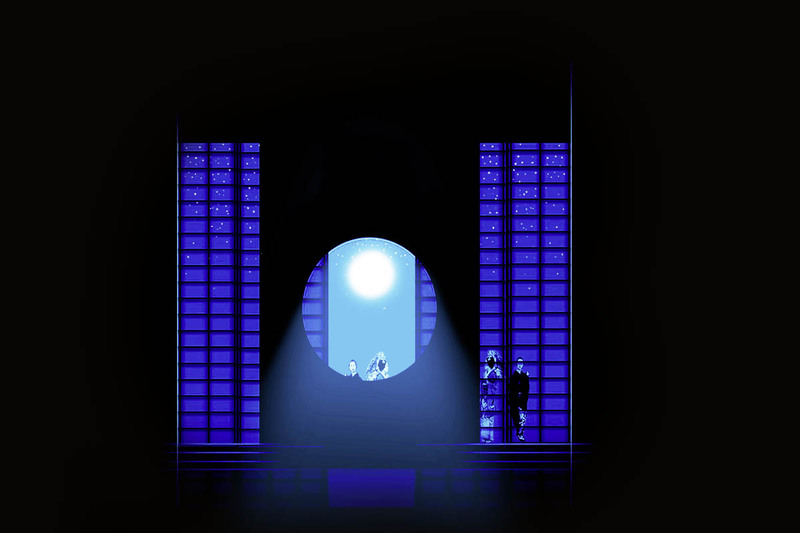 Digital set design by John Pascoe. ‘Lyn Fortin’s extraordinarily expressive acting as Butterfly was so convincing that she easily made us believe in the innocence of her fifteen-year-old protagonist’. 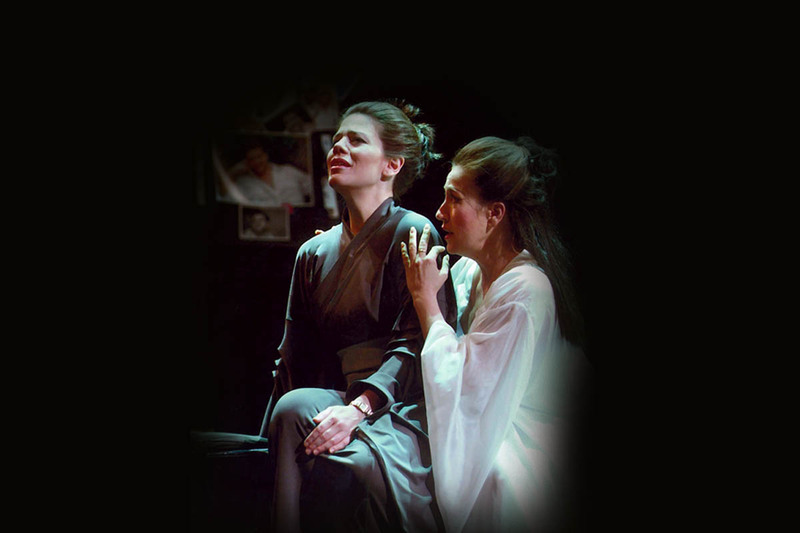 Butterfly (Lyn Fortin) tries to reassure Suzuki (Allyson MacHardy). 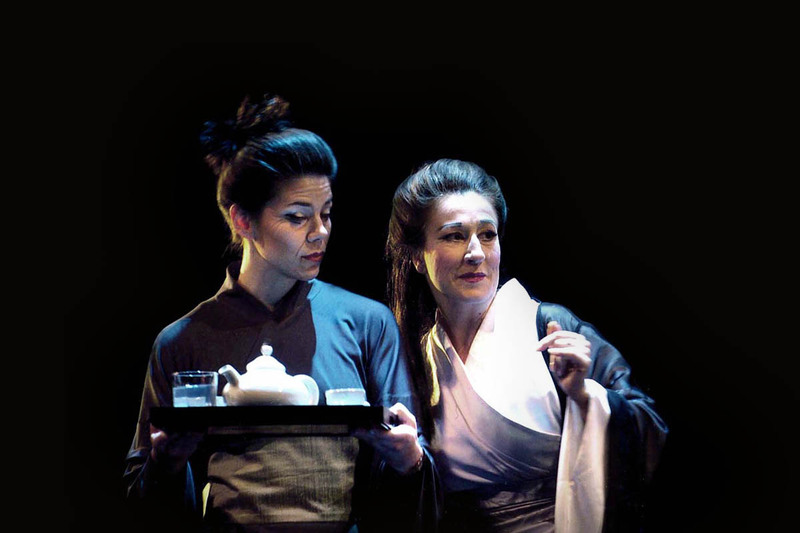 Butterfly (Lyn Fortin) and Suzuki (Allyson MacHardy). 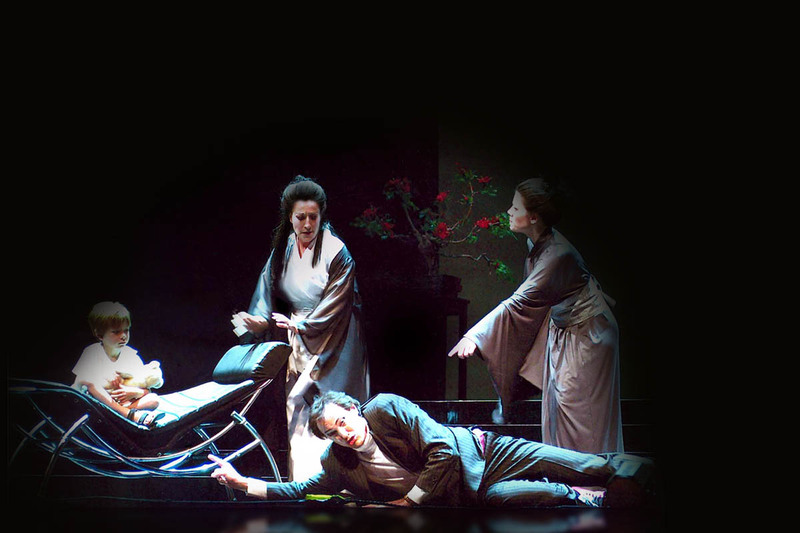 Suzuki (Allyson MacHardy) accuses Goro (Benoit Boutet), as Butterfly (Lyn Fortin) tries to stop her son (Isaac Rheaume Giroux) from overhearing. 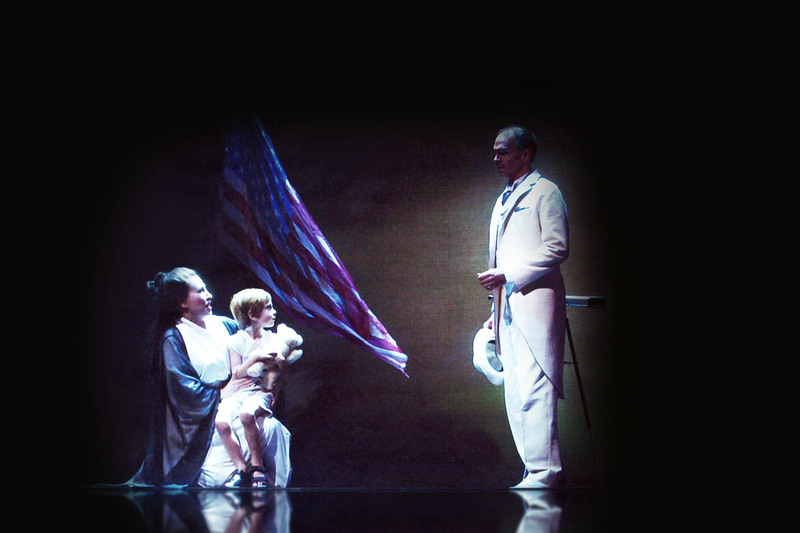 Suzuki (Allyson MacHardy), Butterfly (Lyn Fortin) and her son (Isaac Rheaume Giroux) await the imminent return of Pinkerton. 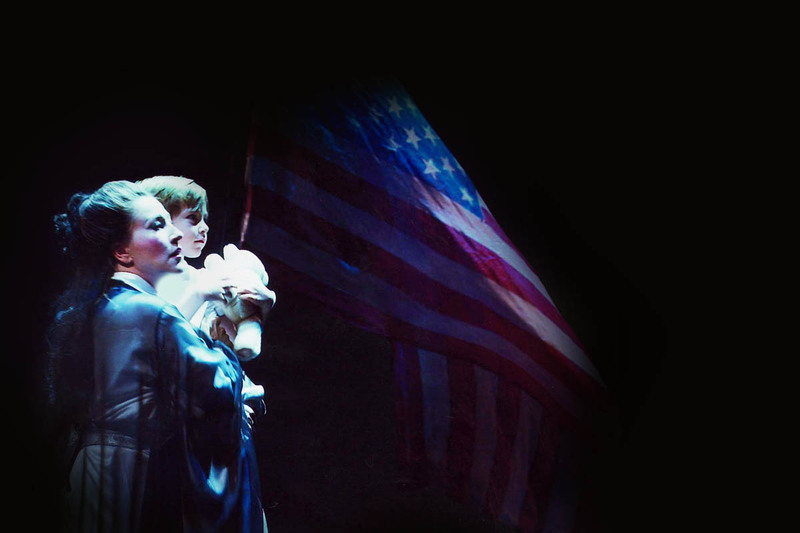 Madam Butterfly (Lyn Fortin) holds her son (Isaac Rheaume Giroux) as they wait for Pinkerton’s return. 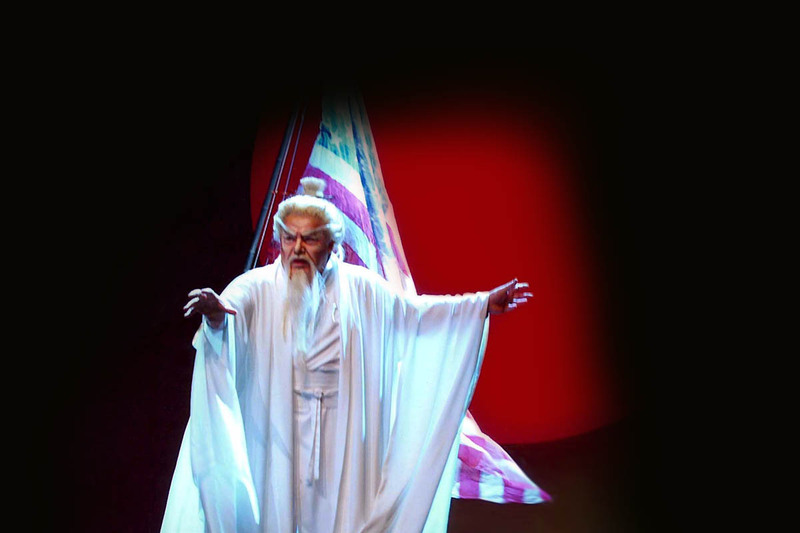 Prince Yamadori (Guy Lessard) arrives to try to persuade Butterfly to marry him. 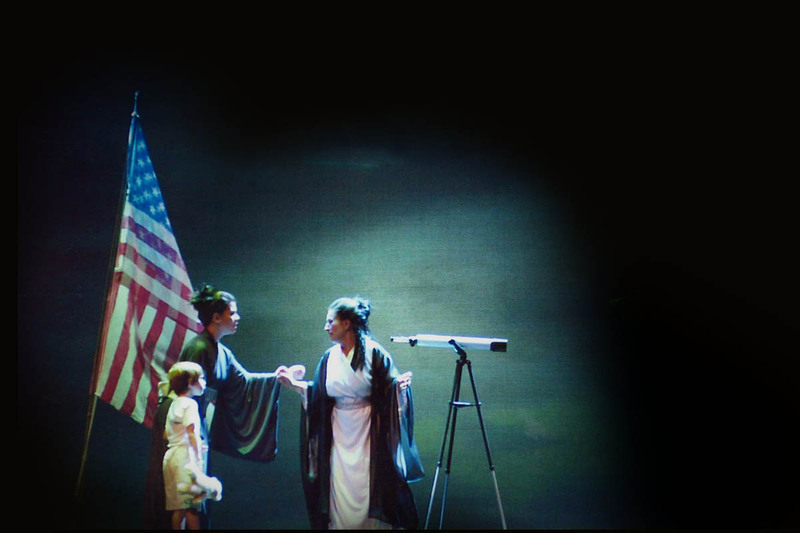 Madam Butterfly (Lyn Fortin) shows Pinkerton’s son (Isaac Rheaume Giroux) to Sharpless (Marc Belleau). 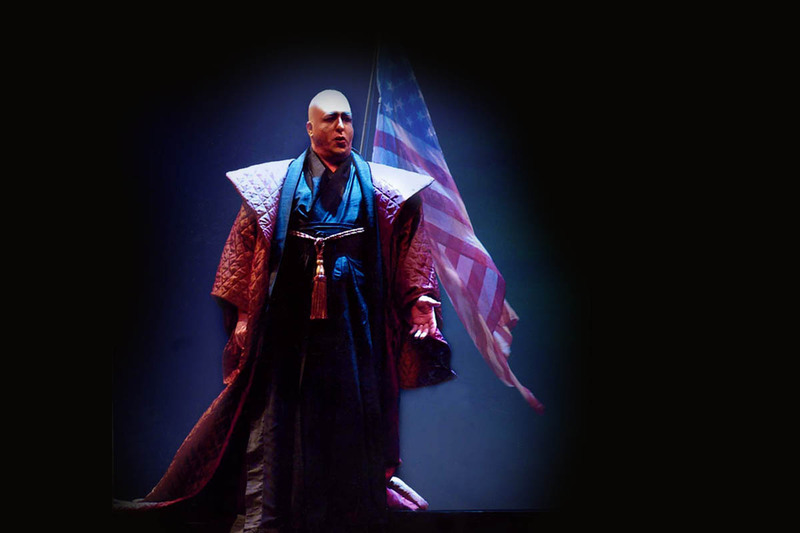 Pinkerton (David Pomeroy) bids goodbye to Madam Butterfly. 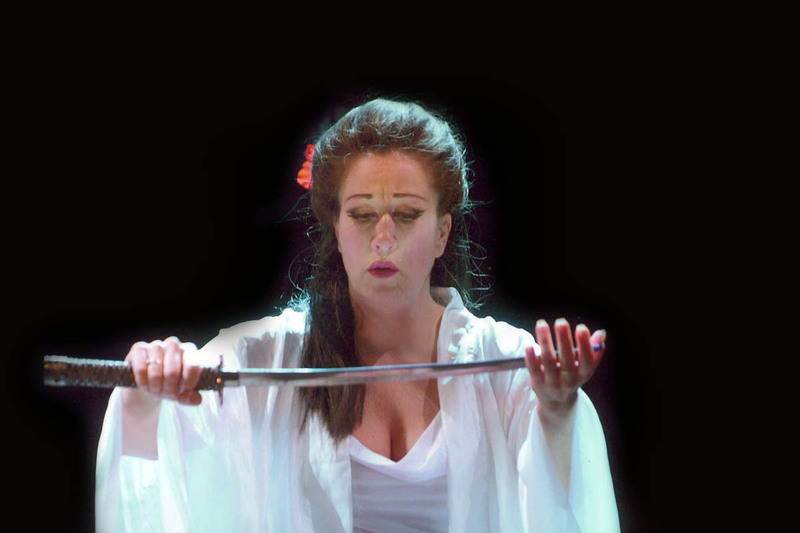 Knowing all is lost, Madam Butterfly (Lyn Fortin) decides on suicide.